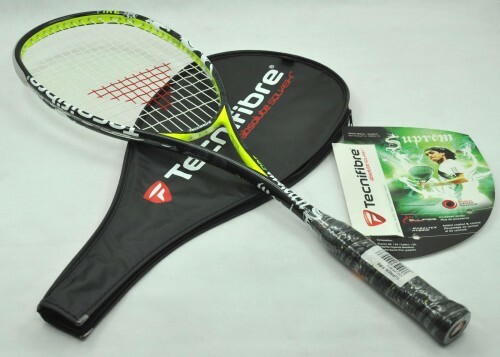 The Tecnifibre Suprem Fire 160 is a squash racket designed for players looking for more control and touch. It has an elongated head design, which also allows you to achieve maximum power. Despite it’s heavier frame weight at 160g, a blend of a high quality string, a mid sized head and a unique frame composition allows this racket to achieve the same power and control results as many of its lightweight competitors. The squash racket has 40% more stability and 80% more rigidity compared to standard square beam frames making it an ideal racket for anybody from intermediate to advanced to professional level. Whilst this is still from the range that aims to deliver control, this racket is engineered to produce extra power to make it a more all-round racket. However, despite this improvement, the racket is priced at the lower end of the range and is one of the better value rackets that Tecnifibre have on offer in this range. The Suprem Fire comes prestrung in Tecnifibre X-One Biphase 1.24 gauge string at 26-30, with a Technifibre Tec Dry grip and comes with a full thermo racket cover. This Racket is factory strung with Tecnifibre MultiFeel string.